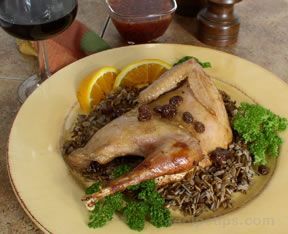 The sweet flavor of the raisin sauce is a nice complement to the moist tender meat from a baked pheasant. Thaw pheasant completely according to package directions. Grease baking dish. Rinse the pheasant under cool running water. After rinsing the outside of the pheasant, rinse out the inside of the pheasant cavity. 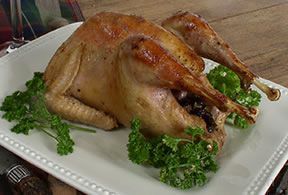 Rub the outside of the pheasant with fresh lemon juice and drizzle lemon juice inside the pheasant cavity. Generously pat salt on the outside of the pheasant and in the cavity. Sprinkle with pepper on the outside of the pheasant and in the cavity. Place bird breast side up in prepared baking dish. Drape 4 slices of bacon over the pheasant, wrapping each slice of bacon underneath the pheasant. 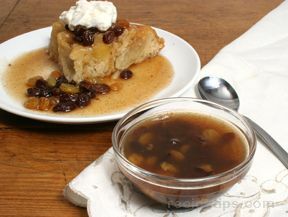 Combine raisins, orange juice, lemon rind, chicken broth and wine. Pour mixture into the baking dish. Bake uncovered for 45 minutes, basting every 10 minutes. During last 15 minutes of baking, remove bacon strips. Baste every 5 minutes during last 15 minutes of baking time. Remove from oven. 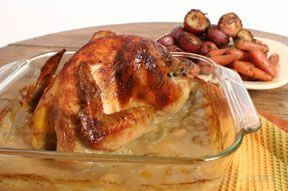 Cut bird in half and serve with remaining juice from the baking pan. *Use additional salt if needed to generously cover the pheasant.